Buddy Hield scored 22 points and made three free throws over the final 20 seconds to send the Sacramento Kings past the Washington Wizards 116-112 on Friday night. SACRAMENTO, Calif. (AP) — De’Aaron Fox had to plea repeatedly with Kings teammate Nemanja Bjelica to shoot the ball after Bjelica missed his only two attempts in the first quarter. Once Bjelica got the message, Sacramento’s offense started to click. 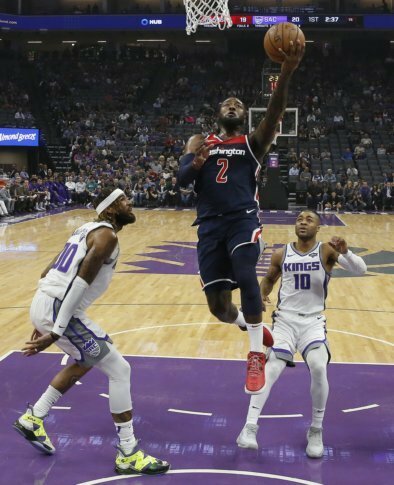 Bjelica made three of his career high-tying six 3-pointers in the fourth quarter and had a key block on John Wall late, and the Kings beat the Washington Wizards 116-112 on Friday night. Bjelica finished with 24 points and 12 rebounds. Buddy Hield scored 22 points and made three free throws over the final 20 seconds for the Kings. Bjelica was scoreless in the first quarter but got going in the second when he scored seven consecutive points. After making back-to-back 3s as part of an 11-0 run in the third, Bjelica made three more shots beyond the arc in the fourth, added a key assist to Hield with 2:45 remaining and then blocked Wall’s shot moments later. Willie Cauley-Stein also had a double-double with 17 points and 11 boards for the Kings. Fox added 17 points and nine assists. The Wizards, who led by six going into the fourth quarter, committed three turnovers in the final 24 seconds. Sacramento led 110-104 with two minutes left before Washington made a late run and pulled to 113-112 on Wall’s 3-pointer with 3.2 seconds remaining. After Fox made one of two free throws, Jeff Green attempted a long inbounds pass but the ball sailed out of bounds. Bjelica then made two free throws to seal the win and end the Kings’ four-game losing streak to the Wizards. Things got chippy at times between the teams during an often sloppy game. Washington had a season-high 21 turnovers while Sacramento committed 19. Wall scored 26 points with eight assists. Kelly Oubre had 22 points and nine rebounds, and Bradley Beal scored 21. Beal skipped the pregame shootaround after sustaining a chest injury in Washington’s 144-122 loss at Golden State on Wednesday and struggled with his shot early. The Wizards’ leading scorer, Beal missed 10 of his first 12 shots, including a long jumper at the halftime buzzer. Beal also appeared to get cut behind his ear midway through the second quarter when he crashed to the floor under the hoop and hit the back of his head on a camera. Two days after grabbing 57 rebounds against Memphis, the Kings held a 53-42 advantage on the boards versus Washington. Wizards: Markieff Morris picked up a technical foul late in the second quarter after a brief altercation with Hield. Kings: Fox was called for a technical foul for arguing with officials after picking up his third foul in the first half. … Sacramento had four team fouls within the first 2½ minutes. … C Zach Randolph was inactive for a sixth consecutive game. The 37-year-old Randolph averaged 14.5 points and 6.7 rebounds with Sacramento last season while starting 57 of 59 games. Wizards: Face the Clippers in Los Angeles on Sunday. Kings: Play at Miami on Monday.